Above: Cambridge LoLander shown with curb side steel deck. 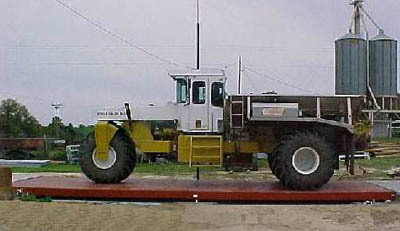 The Cambridge LoLander Truck Scale is 12″ high which means less concrete and construction and shorter approach ramps. Structural tubular steel construction is the key to the Cambridge LoLander design. 2″ drain pipes allow water to flow from the deck to the ground below. This helps prevent water from clinging to the sides of the scale causing corrosion. Above: Cambridge LoLander shown with flat top steel deck. The Cambridge LoLander Truck Scale utilizes the same rugged structural tubular steel construction made famous by Cambridge. The main structural tubular steel beams are cross strutted to maintain structural integrity and weight performance accuracy. The LoLander stand is built to protect the load cells from lightning damage. The load knobs are constructed of heavy duty 2″ steel. The load cells are constructed of high alloy steel and electroless nickle plated finish. The nylatron blocks slide onto 3/4″ rods and can be spaced with 1/4″ nylatron spacers. This eliminates the use of grout for height adjustment. The stands do not need to be attached to the foundation as the checking system prevents impact movement on the stands. Sizes and Capacities subject to change without notification.